Episode #267 of the NLSC Podcast is out now! Unfortunately illness and jetlag got in the way of us recording an episode last week, but Kenny and I are back this week to catch up on the latest news and talk about what we’ve been doing on the virtual hardwood. Patch 1.15 has come through for NBA Live 19. We discuss the latest changes, recap some of the other additions and fixes in recent patches, and give our thoughts on where the game is at after a couple of months. EA Sports recently announced that NBA Live Mobile is the most downloaded basketball game this year. We reflect on how it’s helped the brand, even if it’s not something we’re into ourselves. NBA 2K19 has also received another update recently, namely Patch 1.06. Unfortunately we still haven’t seen the functionality we want to see patched back in for 2K Pro-Am, but there have been some other noteworthy and welcome changes. The in-universe value of Virtual Currency in NBA 2K19’s Neighborhood is truly astonishing this year. We note some of the oddities and issues with the exchange rate. Could a new college football game be paving the way for other college sports titles, including basketball? Can a sports game without licensing succeed in 2018? Our Week in Basketball Gaming included setting records in MyCAREER, playing with WNBA players and taking control of courts in NBA Live 19, and trying to unlock a team that’s close to our hearts in Basketball Classics. We wrap up Episode #267 of the NLSC Podcast with this week’s NBA talk. Topics include surprising results in the East and West, standout rookies, and more thoughts on Carmelo Anthony. Episode #169 of the NLSC Podcast is out now! It’s a three man booth once again this week, as Arcane, Kenny, and I discuss the latest NBA 2K17 previews, our recent sessions of 2K Pro-Am in NBA 2K16, and a few NBA topics. As he was out of town for last week’s episode, Kenny gives his thoughts on league expansion coming to MyLEAGUE and MyGM in NBA 2K17. National teams have been confirmed for NBA 2K17, with Team USA and the Australian Boomers being the first squads to be revealed. The final two pre-order bonuses for NBA 2K17 have been confirmed, with one of them being the 1992 Dream Team (Charles Barkley included!). We discuss whether or not it’s a fair move to make content like that pre-order exclusive. We also note that Danilo Gallinari will appear on the Italian cover of NBA 2K17, and give our thoughts on the first official screenshot featuring (most of) Team USA 2016. In Our Week in Basketball Gaming: a rough start for the new NLSC 2K Pro-Am Team – Snoop’s Sliders – and further impressions of NBA Live Mobile. Moving on to some NBA topics, we discuss the NBA’s decision to move the 2017 All-Star Weekend from Charlotte, due to the ongoing issues with the HB2 bill. NBA Legend Nate Thurmond passed away last week. He was before our time, but we still have a few things to say in tribute to the first NBA player to ever register a quadruple-double. If you want to pick up a Kevin Durant Oklahoma City Thunder jersey, there are some excellent bargains going right now that won’t even set you back a dollar. Amar’e Stoudemire has called it a career, so we reminisce about some of STAT’s highlights. We wrap up Episode #169 of the NLSC Podcast with the return of Trivia Time! We’re back to our regular schedule this week, with Episode #166 of the NLSC Podcast! Join Arcane, Kenny, and I as we talk about the release of NBA Live Mobile, recent NLSC Greatness games in 2K Pro-Am, and the latest offseason movement, including Kevin Durant’s surprising departure. The server move is complete and a few lingering problems have been addressed, so it should be business as usual from here on out! NBA Live Mobile has been released worldwide for Android and iOS devices. We offer up some initial impressions of the game, and touch again on the future of NBA Live on consoles. In Our Week in Basketball Gaming: Another win for NLSC Greatness, grinding towards 99 Overall, and paying towards 88 Overall. Kevin Durant has shocked the basketball world by joining the Golden State Warriors. What does this mean for next season, and his legacy? We give our thoughts on the other major offseason moves from the past week, including Dwyane Wade and Rajon Rondo to the Chicago Bulls. Episode #166 of the NLSC Podcast ends with our new favourite game, Trivia Time! Can you answer questions about some old school basketball games before Arcane and Kenny? Following the initial soft launch in Canada, NBA Live Mobile is now available worldwide. The game, which is available free for Android and iOS devices, features five-on-five gameplay and card-based team building, similar to Ultimate Team in the console versions of NBA Live. Not unlike Ultimate Team, NBA Live Mobile does feature microtransactions, for anyone who wishes to spend real money on immediate boosts. 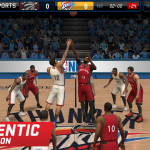 Gameplay consists of Live Events, which are skills challenges that are inspired by what’s happening in the real NBA, as well as a two minute quarter in-game scenarios. Modes include Head-to-Head games, Season Mode, Friends Matches, and League play. Star players from yesterday and today are included in NBA Live Mobile, with Special Abilities providing enhanced versions of players that will give your team an extra boost. Once again, NBA Live Mobile is available through the Play Store for Android, and the App Store for iOS. A console version of NBA Live 17 is currently slated for release in early 2017; we’ll try to get some more information on that as soon as we can. In the meantime, we’ll be discussing NBA Live Mobile in this week’s NLSC Podcast, but if you pick up the game yourself, be sure to join in the discussion here in the NLSC Forum. For a breakdown of the key features of NBA Live Mobile, please see below.